Many of you have met me in real life as a result of my pickle evangelism. Now, I have to tell you a little bit about this. I’m a pickle fan, yes, but pickle evangelical? I’ll qualify that by saying how my relationship with my refrigerator has been a long and rocky road. Learning that I could modify any waterbath canning recipe, not only making it smaller, but switching up the vinegar, adding or subbing other kinds of veggies and other off-the-cuff experimentation, all via fridge pickling changed my life. I’ve gone across the country on the first half of my book tour showing folks how to use up those veggies (before they compost in the crisper drawer). Homemade pickles make great snacks for parties, items to trade at food swaps, or even bestow upon (local) friends as holiday gifts. Have I lost you already? Don’t worry, there will be no final exam on pickling methods and terminology. The only thing you will be required to do is try a batch of refrigerator pickles. A regular-mouth jar will be better for pickling since it will help prevent your veggies from all floating to the top once you pour over the brine. Some may still float, but the constriction (vs. the straight-sided wide-mouth jar) is helpful. If you become a pickle evangelical, too, grab some of these plastic lids so your re-usable bands don’t rust. 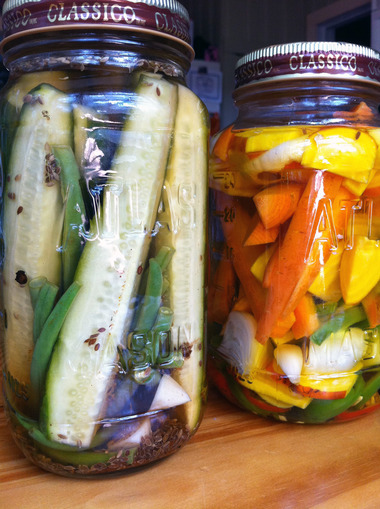 Fridge pickling is a one-way equation. Any waterbath canning recipe can be turned into a fridge pickle, but any fridge pickle may NOT be turned into a waterbath-safe recipe. My pickle bible is Linda Ziedrich’s The Joy of Pickling; I defer to her excellent flavor ideas when I have a pile of vegetables at my disposal. Check out page 230 in my book for a quick and easy just-like-Lower-East-Side dill pickled cucumbers recipe!